Overview: What do you want to flash today? This is the must-have application for everyone using or planning to use 4EXT Recovery. Please check the list about currently supported devices! 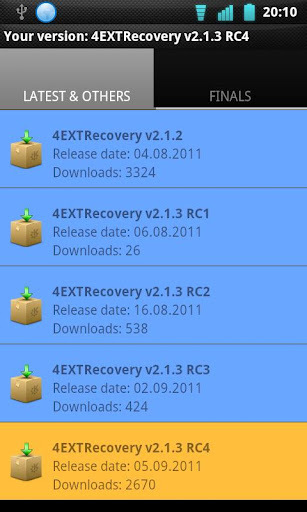 By buying this app, you not only get a feature rich application that lets you control, configure and handle the advanced features of 4EXT Recovery with comfort, you also contribute to the future of 4EXT Recovery itself! Thanks to the great community the project will continually improve and stay as active as possible! For a fully functional, free preview, please try the free "Recovery Updater" which includes a 3 day preview of 4EXT Recovery Control. Your device MUST BE ROOTED and currently you need to be S-OFF to use all the features! Please see http://www.4ext.net for a complete feature list. There are too many to list them here. *) Check your backups' health to ensure they will restore later when you need them, by verifying their md5sums! *) Want to know which partitions a certain backup contains? -> This and more information is automatically displayed in the list of your backups. for "Advanced Backups": While you are selecting / deselecting partitions, it will display and update the currently needed space to complete that custom backup set. *) Optionally display the md5sums of all the files you are going to flash in one go! -> So you can make sure all are ok before you flash them. *) Want to format all partitions with a file system of your choice before you flash a new rom? *) Prefer to stay inside recovery after all your selected operations are done? No problem. *) Change the look and feel of your Recovery with a nice colour picker! *) Try out as many themes you like with a live preview. -> it will look the same as if you rebooted into recovery to check it out. *) Had a bad Recovery session and didn't have the time to save the log file? No problem, let the app save it to your sdcard! -> if in rare cases this doesn't work, let the app download a zip file including the recovery version you selected to your sdcard. ->The integrity of this downloaded recovery zip is automatically verified for you so you don't need to check md5sums! *) View all changelogs or known issues of any version available to your device. *) Encountered a problem? Use the report issue button to tell me about your problem and optionally attach valuable info such as your last recovery log to help me help you much better. Please check the changelog inside the app or on www.4ext.net for all changes. v2.2.7: file browser improvements, safe reboot, translations updates, ..
Notifications: get notified about new recovery releases and in cases where there are any new known issues concerning your currently installed version. 0 Komentar untuk "4EXT Recovery Control v2.2.8 apk"